Like a good story, I start with an intent or theme. Mine was to connect, heal and balance the feminine within me and in humanity. With my intent at the lead, I wander my home in search of objects, elements, medicine. Some are clear right away—the how and where they fit in—whereas others come clear later. They may come with their own memory—a person, time or place—or simply hold an energy that draws me. I just trust and, with each selection, I allow my intent to focus and evolve. The healing has begun. 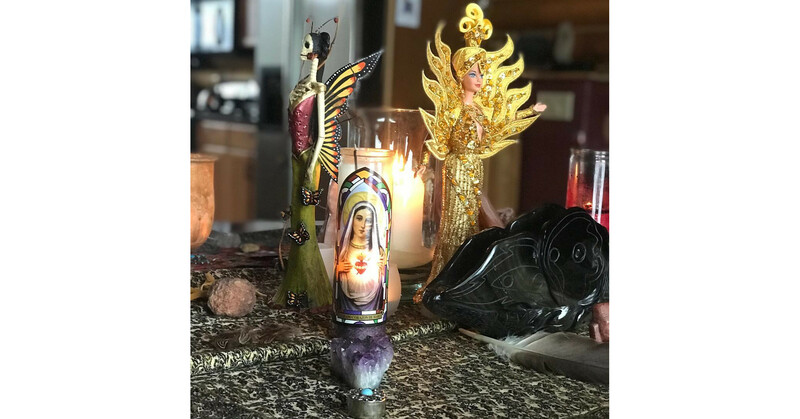 The location of my altar depends… I want enough room for my objects and, more importantly, a space in which I can practice freely. If I want to dream with my intent, I might choose my bedroom. If I want to actively work an intent, I opt for my healing room or, in this case, my dining table! Any space is sacred once we say so— the garage, the floor of a closet; it is a temple of our making. I like to use a ‘mesa’ cloth as a base for my Altar. Along with location, the mesa provides a container. Like a womb, it is here to nourish and protect the seed of my intent. I have a few shawls/cloths that I only use in this way, that they may absorb and retain the ceremonial energy. I place the objects on my mesa each with their own intent and yet weaved together in a beautiful healing story— a prayer. I usually start at the center, honor the four directions around it and then expand from there, feeling into where each object belongs and what medicine they bring. For larger altars, I like to create stations for activities like smudging, water cleansing, or reciting a particular mantra. The altar is a scared space but it is also a playground. I approach it with reverence and a childlike whimsy. Rules can constrict the creativity needed to spark intent into action. My altar is all-inclusive, from Mother Mary to Sun Goddess Barbie! It is a place where I can engage my intent, however that may look, and the more it inspires me (and makes me smile), the deeper I go.